01. The objective of this Standard is to prescribe and guide the presentation of additioanl information in the financial statements of banks and similar financial institutions. 02. 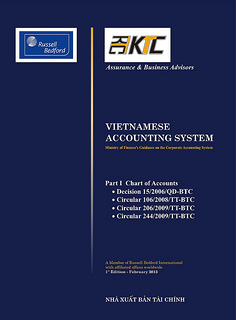 This Standard should be applied for banks and similar financial institutions (hereinafter referred to as banks), including banks, credit institutions, non-banking credit institutions, similar financial institutions whose principal operations are to take deposits and borrow with the objective of lending and investing within the scope of banking operations as stipulated by the Law on Credit Institutions and other related legislations. 03. This Standard provides guidance in the presentation of nessecary information in separate financial statements and consolidated financial statements of banks. In addition, banks are encouraged to disclose information on their liquidity and risk management capability. This Standard should be also applied on consolidated basis for groups undertaking banking operations. 04. This Standard supplements other standards applicable for banks unless they are specifically exempted in a standard. e) the basis for the determination of charges for general banking risks and the accounting treatment of such charges (see paragraphs 41 to 43). 08. The principal types of income arising from the operations of a bank include interest, fees for services, commissions and other business operating results. Each type of income is separately disclosed in order that users can assess the performance of a bank. Such disclosures are in addition to those of the source of income required by VAS 28, Segment Reporting. 09. The principal types of expenses arising from the operations of a bank include interest, commissions, losses on loans and advances, impairment losses of investments and general administrative expenses. Each type of expense is separately disclosed in order that users can assess the performance of a bank. 10. Income and expense items should not be offset except for those relating to assets and liabilities and to hedges which have been offset in accordance with paragraph 19. 11. Offsetting in cases other than those relating to hedges and to assets and liabilities which have been offset as described in paragraph 19 prevents users from assessing the performance of the separate activities of a bank and the return that it obtains on particular classes of assets. (c) dealings in foreign currencies. 13. Interest income and interest expense are disclosed separately in order to give a better understanding of the composition of, and reasons for changes in, net interest. 14. Net interest is a result of both interest rates and the amounts of borrowing and lending. It is very useful if management provides a commentary about average interest rates, average interest earning assets and average liabilities for the period. In cases where government provides interest subsidization, the extent of subsidized deposits and facilities and their effect on net income should be disclosed in the financial statements. 15. A bank should present a balance sheet that groups assets and liabilities by nature and lists them in the descending order of their relative liquidity. 17. The most useful approach to the classification of the assets and liabilities of a bank is to group them by their nature and list them in the approximate order of their liquidity which may equate broadly to their maturities. Current and non-current items are not presented separately because most assets and liabilities of a bank can be realised or settled in the near future. 19. Any asset or liability in the balance sheet should not be offset by the deduction of another liability or asset unless a legal right of set-off exists and the offsetting represents the expectation as to the realisation or settlement of the asset or liability. (vi)other commitments, note issuance facilities. 21. Many banks also enter into transactions that are presently not recognised as assets or liabilities in the balance sheet but which give rise to contingencies and commitments. Such off balance sheet items often represent an important part of the business of a bank and may have a significant bearing on the level of risk to which the bank is exposed. These items may add to, or reduce, other risks, for example by hedging assets or liabilities on the balance sheet. 22.The users of the financial statements need to know about the contingencies and irrevocable commitments of a bank in order to assess its liquidity and solvency and the inherent possibility of potential losses. 23. A bank should disclose an analysis of assets and liabilities into relevant maturity groupings based on the remaining period at the balance sheet date to the contractual maturity date. 24. The matching and controlled mismatching of the maturities and interest rates of assets and liabilities is fundamental to the management of a bank. It is unusual for banks ever to be completely matched since business transacted is often of uncertain term and of different types. An unmatched position potentially enhances profitability but can also increase the risk of losses. 25. The maturities of assets and liabilities and the ability to replace, at an acceptable cost, interest-bearing liabilities as they mature, are important factors in assessing the liquidity of a bank and its exposure to changes in interest rates and exchange rates. In order to provide information that is relevant for the assessment of its liquidity, a bank discloses, as a minimum, an analysis of assets and liabilities into relevant maturity groupings. (e) from 3 years to 5 years; and. (e) from 5 years and over. Frequently the periods are combined, for example, in the case of loans and advances, by grouping those under one year and those over one year. When repayment is spread over a period of time, each instalment is allocated to the period in which it is contractually agreed or expected to be paid or received. 27. The maturity periods adopted by a bank should be the same for assets and liabilities. This makes clear the extent to which the maturities are matched and the consequent dependence of the bank on other sources of liquidity. (c) the remaining period to the next date at which interest rates may be changed. The analysis of assets and liabilities by their remaining periods to the repayment dates provides the best basis to evaluate the liquidity of a bank. A bank may also disclose repayment maturities based on the original period to the repayment date in order to provide information about its funding and business strategy. In addition, a bank may disclose maturity groupings based on the remaining period to the next date at which interest rates may be changed in order to demonstrate its exposure to interest rate risks. Management may also provide, in its commentary on the financial statements, information about interest rate exposure and about the way it manages and controls such exposures. 29. In practice, demand deposits and advances are often maintained for long periods without withdrawal or repayment; hence, the effective date of repayment is later than the contractual date. Nevertheless, a bank discloses an analysis expressed in terms of contractual maturities even though the contractual repayment period is often not the effective period because contractual dates reflect the liquidity risks attaching to the bank's assets and liabilities. 30. Some assets of a bank do not have a contractual maturity date. The period in which these assets are assumed to mature is usually taken as the expected date on which the assets will be realised. 31. The evaluation of the liquidity of a bank from its disclosure of maturity groupings should be made in the context of local banking practices, including the availability of funds to banks. 32. In order to provide users with a full understanding of the maturity groupings of assets and liabilities, the disclosures in the financial statements may need to be supplemented by information as to the likelihood of repayment within the remaining period. Hence, management may provide, in its commentary on the financial statements, information about the effective periods and about the way it manages and controls the risks and exposures associated with different maturity and interest rate profiles. 33. A bank should disclose any significant concentrations of its assets, liabilities and off balance sheet items. Such disclosures should be made in terms of geographical areas, customer or industry groups or other concentrations of risk. A bank should also disclose any significant net foreign currency exposures. 34. A bank should disclose significant concentrations in the distribution of its assets and liabilities because it is a useful indication of the potential risks inherent in the realisation of the assets and liabilities of the bank. Such disclosures are made in terms of geographical areas, customer or industry groups or other concentrations of risk which are appropriate in the circumstances of the bank. A similar analysis and explanation of off balance sheet items is also important. Such disclosures are made in addition to any segment information required by VAS 28, Segment Reporting. 35. The disclosure of significant net foreign currency exposures is also a useful indication of the risk of loan losses arising from changes in exchange rates. (c) the aggregate amount of the provision for losses on loans and advances at the balance sheet date. 37. Any amounts set aside in respect of loss provision on loans and advances in addition to those losses that have been recognised in accordance with Accounting standard on Financial Instruments should be accounted for as appropriations of retained earnings. Any credits resulting from the reduction of such amounts should be accounted for as an increase in retained earnings and are not included in the determination of net profit or loss for the period. 38. A bank is allow to set aside amounts for losses on loans and advances in addition to those losses that have been recognised in accordance with Accounting standard on Financial Instruments. Any such amounts should be accounted for as appropriations of retained earnings. Any credits resulting from the reduction of such amounts should be accounted for as an increase in retained earnings and are not included in the determination of net profit or loss for the period. 39. Users of the financial statements of a bank need to know the impact that losses on loans and advances have had on the financial position and performance of the bank. This helps them judge the effectiveness with which the bank has employed its resources. Therefore a bank discloses the aggregate amount of the provision for losses on loans and advances at the balance sheet date and the movements in the provision during the period. The movements in the provision, including the amounts previously written off that have been recovered during the period, are shown separately. 41. Any amounts set aside for general banking risks, including future losses and other unforeseeable risks or contingencies should be separately disclosed as appropriations of retained earnings. Any credits resulting from the reduction of such amounts result in an increase in retained earnings and should not be included in the determination of net profit or loss for the period. 42. A bank is allowed to set aside amounts for general banking risks, including future losses or other unforeseeable risks, in addition to the charges for losses on loans and advances determined in accordance with paragraph 38. A bank is also allowed to set aside amounts for contingencies. Such amounts for general banking risks and contingencies do not qualify for recognition as provisions under Accounting standard Provisions, Contingent Liabilities and Contingent Assets. Therefore, a bank recognises such amounts as appropriations of retained earnings. This is necessary to avoid the overstatement of liabilities, understatement of assets, undisclosed accruals and provisions which create the opportunity to distort net income and equity. 43. The income statement cannot present relevant and reliable information about the performance of a bank if net profit or loss for the period includes the effects of undisclosed amounts set aside for general banking risks or additional contingencies, or undisclosed credits resulting from the reversal of such amounts. Similarly, the balance sheet cannot provide relevant and reliable information about the financial position of a bank if the balance sheet includes overstated liabilities, understated assets or undisclosed accruals and provisions. 44. A bank should disclose the aggregate amount of secured liabilities and the nature and carrying amount of the assets pledged as security. 45. Banks are required to pledge assets as security to support certain deposits and other liabilities. The amounts involved are often substantial and so may have a significant impact on the assessment of the financial position of a bank. 46. Banks commonly act as trustees that result in the holding or placing of assets on behalf of individuals, trusts and other institutions. Provided the trustee or similar relationship is legally supported, these assets are not assets of the bank and, therefore, are not included in its balance sheet. If the bank is engaged in significant trust activities, disclosure of that fact and an indication of the extent of those activities is made in its financial statements because of the potential liability if it fails in its fiduciary duties. For this purpose, trust activities do not encompass safe custody functions. 47. Certain transactions between related parties may be effected on different terms from those with unrelated parties. For example, a bank may advance a larger sum or charge lower interest rates to a related party than it would in otherwise identical circumstances to an unrelated party. Similarily, advances or deposits may be moved between related parties more quickly and with less formality than is possible when unrelated parties are involved. Even when related party transactions arise in the ordinary course of a bank's business, information about such transactions is relevant to the needs of users and its disclosure is required by VAS 26 – Related Party Disclosure. 48. When a bank has entered into transactions with related parties, it should disclose the nature of the related party relationship, the types of transactions, and the existing balances necessary for an understanding of significant impacts and relation to the financial statements of the bank. The elements that would normally be disclosed to conform with VAS 26 include a bank's lending policy to related parties. (d)irrevocable commitments and contingencies and commitments arising from off balance sheet items.